I am releasing the springs on the bottom sampler. Asst. Survey Technician Manuel Cruz waits for the claws to open which will allow us to empty the “g stk M” (green sticky mud) into a bucket for observation. One of the most interesting (and fun) mornings onboard Rainier happened during our first week at sea. After doing a few days of surveying from an anchorage off SW Ukolnoi Island, we began a transit to a new anchorage off of Wosnesenski Island. On the way, we took a series of bottom samples from Rainier’s deck. The purpose of taking a bottom sample is to determine the composition of the ocean floor. It is important to record this data and combine it with bathymetric survey data so that ships will know whether or not the area is good for anchoring. A muddy or sandy bottom is best because the anchor can take hold. A stone-covered bottom is not desirable for anchoring because the anchor cannot dig in, and, if it does, there is this risk that it could break if caught under a large stone. Taking bottom samples is a rather simple process. We work in teams of three on deck. One person is in the Plot Room to record data and prepare for the next sample. On deck, a crew member operates a winch that is attached to an A-frame. At the end of the cable is a claw-like, spring-loaded bottom sampler that is lowered into the water. 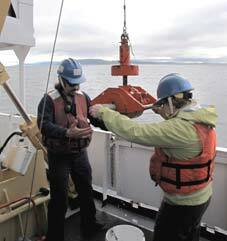 As it descends, the winch operator calls out depths to one of the two people taking the sample. The depth is relayed to the bridge via radio. When the claw hits bottom, the springs disengage and the claws clamp shut, holding a sample. The person in the Plot Room listens for the direction “Mark”, and marks the sample’s position on the computer program. As the sample is raised, the winch operator calls out the depths again. This information is radioed to the bridge along with any corrections they must make to adjust the ship’s position. For example, “50-straight up and down” means that the sampler is at 50 meters and the cable is straight up and down (the way you want it to be). A call of “aft” or “forward” means that the cable is coming up at an angle and the bridge must help to correct this. Once the sample is raised, it is emptied into a bucket and examined for color and composition. This is radioed to the Plot Room and recorded. The bottom sampler is readied for the next drop as the Plot Room directs the ship to the next location and readies the computer program for the next data input. During our bottom sampling, the data was all recorded at “g stk M”—green, sticky mud. It had a sulfuric smell, which, if you think about all of the volcanoes in the area, makes sense. This will be my final Ship Log, as we are scheduled to pull anchor this afternoon and start our transit to Kodiak Island. I can’t believe that the end of three weeks is coming to a close. I was talking to the CO about the number of people and/or agencies who contribute to the production of an individual chart. There are large groups—like NOAA, the Coast Guard and the Army Corps of Engineers, for example. There are also smaller groups and individuals as well. Everything from sounding depths to buoy locations to shoreline topography to notes on the locations of buildings, lighthouses and even church steeples are included. I’ve spent some time studying the current paper chart of the area we have been surveying (#16549: Alaska Peninsula, Cold Bay and Approaches) and the most striking feature is, of course, the absence of data in the center. I can’t wait to acquire an updated copy when it is available (some sources say, depending upon the priority, could be up to three years; although the NOAA goal is “Ping to Chart in 90 days”). Knowing that I helped to play even a very small part in helping improve navigation safety is a great feeling! I’d like to thank the officers and crew aboard Rainier for making my Teacher at Sea experience the adventure of a lifetime! I’ve learned so much about life at sea from new friends who have been patient and hospitable. I leave with a great respect for all of the individuals who call Rainier both work and home for eight or nine months out of the year. They are away from husbands, wives, children, friends and pets for a long time; however, the community that they have built aboard the ship seems to offset some of the wishing for home. Safe Sailing and Happy Hydro, my friends! -Search for historic nautical charts and compare how they change from year to year. Kodiak Island is, at 3,588 sq. miles, the second largest in the United States. It is the oldest European settlement in Alaska and is known as Alaska’s “Emerald Isle”. Before its “discovery” by Russian explorer Stephen Glotov in 1763, the island was occupied solely by the Sugpiaq (Alutiiq) people. In 1912, Kodiak was caught in the drifting ash from the eruption of Novarupta Volcano which buried the island under 18 inches of ash. A more recent natural disaster targeted the island in 1964, when a 9.2 earthquake struck Alaska and set off a tsunami. This seismic sea wave virtually destroyed downtown Kodiak and its fishing fleet. Today, over 13,000 residents call Kodiak home. This entry was posted in 2009, NOAA Teacher at Sea, Stacey Klimkosky and tagged bottom sampler, CTD, Hydrographic survey, multibeam sonar, nautical chart, noaa ship rainier, pavlov islands, polygon, seafloor mapping. Bookmark the permalink.